Senior cats can face challenges with mobility and food sensitivities. 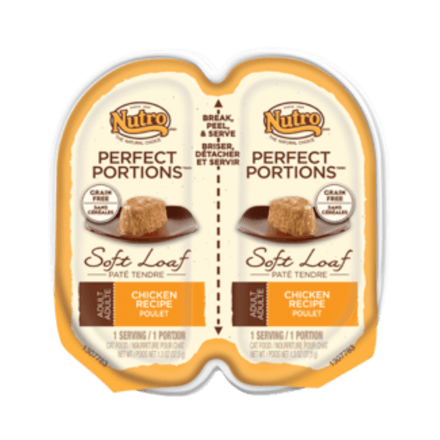 NUTROTM WHOLESOME ESSENTIALSTM Indoor Senior Dry Cat Food Chicken & Whole Brown Rice Recipe supports digestion with fibre from whole brown rice. Our premium senior cat foods also are fortified with omega fatty acids and taurine to support heart health. Real chicken is the #1 ingredient for muscle mass and mobility, and our natural fibre blend helps minimize hairball formation. 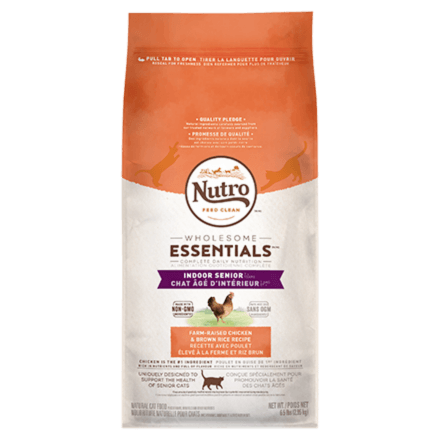 Give your senior indoor cat premium, natural ingredients with a taste you know they’ll enjoy. These are the recommended feeding amounts based on the ideal body condition for senior cats of various weights. Individual cats’ energy requirements may differ. Adjust the amount fed to obtain or maintain your cat’s optimum weight. Keep fresh drinking water available at all times, provide plenty of exercise and see your veterinarian regularly. Serve dry or lightly moistened. To help maintain freshness, we recommend sealing the bag tightly and storing it in a cool, dry location. ‡Use a standard 8 oz. (250 ml) measuring cup, which holds 3.64 oz. 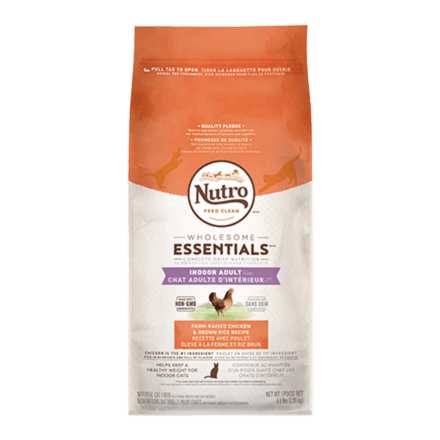 (103.2 g) of NUTROTM WHOLESOME ESSENTIALSTM Indoor Senior Cat Chicken & Whole Brown Rice Recipe Dry Cat Food. 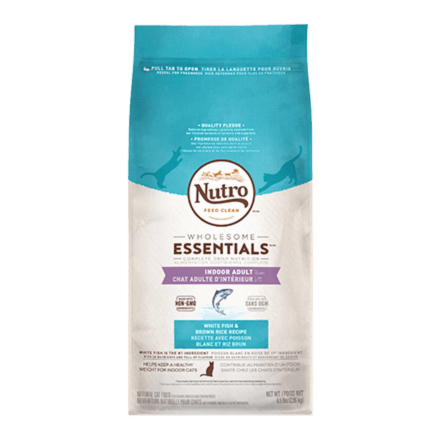 NUTRO™ WHOLESOME ESSENTIALS™ Indoor Senior Cat Chicken & Whole Brown Rice Recipe Dry Cat Food is formulated to meet the nutritional levels established by the AAFCO Cat Food Nutrient Profiles for maintenance.